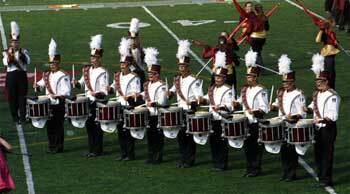 By Lance Piantaggini Reader, if you haven't heard of Thom Hannum or UMass-Amherst, you are clearly new to the marching activity, so welcome aboard! On the other hand, the rest of us drum corps enthusiasts are ever so familiar with Thom and his marching percussion program at the university. After all, he has been involved with drum corps for more than 30 years, and UMass was home to some of drum corps' leading instructors throughout the percussion community. What you might not know is that over the years the number of UMass alumni teaching drum corps has now reached more than 34, who are involved with 19 different corps! In DCI alone, nine out of the current top 12 finalists have been represented by UMass alumni. Six of them are represented in 2005, including five caption heads! "Who is on this list of alumni?" you might ask. Feel free to discover who has attended UMass Amherst from this star-studded collection of names along with a few fresh faces on the scene. Name (years at UMass) -- Drum corps teaching experience Seth Adams ('00-'05) -- Carolina Crown '05 Jack Foulis ('98-'01) -- East Coast Jazz '03-'05 Jim Ancona ('87-'92) -- Troopers '91, Boston Crusaders '92, Star of Indiana '93-'96, Crossmen '97-'98, Santa Clara Vanguard '98-'04, Carolina Crown '05, University of Delaware Nick Angelis ('92-'95) -- Blue Knights '96, Boston Crusaders '97, Crossmen '98, Spirit of JSU '03-'05 (caption head), Troopers '05 Jon Boisjolie ('95-'98) -- Boston Crusaders '00, Glassmen '01-'02, Magic of Orlando '03 Jason Dyhouse ('95-'97) -- Troopers '98-'99 , Spirit of Atlanta '00 Damon Grant ('95-'98) -- Crossmen '04-'05 Ian Hale ('05 grad student) -- Glassmen '02, Magic of Orlando '03, Madison Scouts '04,Carolina Crown '05, Allegiance Elite '02-'05 Darren Hazlett ('95-'98) -- Crossmen '99, '04-'05*caption head* Jeff Hope ('96-'99) -- Troopers '01, Magic of Orlando '02, Targets '03-'05 (caption head), Madison Scouts '04-'05 Jim Hoover ('87-'91) -- Spartans '00 Kelly Howell ('01-'05) -- Crossmen '05 Olin Johannessen ('01-'05) -- Boston Crusaders '05 Shawn Kelley ('92-'96) -- Boston Crusaders Rob Keedy ('04 exchange student) -- Madison Scouts '05 Jack Mansager ('91-'94) -- Crossmen '97-'98, '04-'05 Steve McGrath ('93-'96) -- Connecticut Hurricanes ('99-'00) Brandon McNutt ('99-'02) -- East Coast Jazz '03-'05 Colin McNutt ('89-'92) -- Star of Indiana '93-'96, Crossmen '97-'99, Glassmen '00-'02 (caption head), Magic of Orlando'03 (caption head), Madison Scouts '04- '05 (caption head) Todd Morrison ('86-'91) -- Boston Crusaders '93 Iain Moyer ('95-'98) -- Crossmen '99, Glassmen '00-'02, Magic of Orlando '03, Madison scouts '04-'05, University of Northern Alabama Chris Perna ('96-'00) -- Syracuse Brigadiers '03-'05 (caption head) Matt Powers('88-'91) -- Bluecoats '92, Marauders '93 Chris Rapaki ('00-'05) -- Carolina Crown '05 Chris Retschulte ('95 grad student) -- Boston Crusaders '97-'99, Blue Knights '00-'01, Santa Clara Vanguard '04-'05 Dean Scheuer ('94-'95) -- Blue Knights '96-'97, Phantom Regiment '00-'01 Zach Schlicher ('02-'04) -- Madison Scouts '05 Chris Slipp ('00-'04) -- East Coast Jazz '05 Andy Smith ('95-'97) -- Crossmen '97 Kate Tice ('94-'97) -- Capital Regiment '02-'05 Brian Tinkel ('92-'95) Crossmen '97-'99, Glassmen '00-'02, Magic of Orlando '03, Madison Scouts '04, Carolina Crown '05 (caption head) Chris Vale ('00-'04) -- Madison Scouts '04, Cadets '05 Eric Vargo ('91-'95) -- Troopers '94-'95, Boston '98 Mike Wasielewski ('95-'98) -- Spartans '00-'05 Dave Wolf ('98-'01) -- Spartans '03, Oklahoma University Josh Syzmanski ('99-'03) -- Targets '03 Phi Beta Delta You might recognize many alumni who have taught with each other from corps to corps. They all share a common thread, and that thread began to weave with their induction into Phi Beta Delta, the unofficial-official percussion section fraternity. "I don't know exactly when it got started," remarked Thom. "the 'PBD' letters started to appear on shirts here and there worn only by a few members during the late '80s, and now the Phi Beta Delta sweatshirts and jackets can be spotted throughout the campus." The Greek letters humorously originated from the meaning, "I Banga Drum." There is a tradition where the PBD alumni meet in the stadium parking lot and tailgate at the home football games. The drum line literally marches over to the gathering to warm up prior to the halfime and post-game show performances. The alumni cheer as past memories glimmer within their eyes at the sound of the cadence tap-off and other familiar music. You can expect this kind of family atmosphere from the UMass marching percussion program. That family feeling still exists between everyone involved in DCI today. "It's hard to imagine any other university has that many people who are actively teaching in DCI this year," remarked Thom. "It is quite impressive to acknowledge the number of people who achieved so much as students and are now teaching very successful drum corps." So many alumni have had the opportunity to seek careers in educating the world's leading marching percussion sections because of the strength and quality of Thom Hannum's program. This didn't just happen overnight. It was years in the making. "It is obvious that we have worked very hard to get the percussion section to a point where there are close to 50 members involved in something special," Thom says. "It takes numbers, quality, and great people to recognize what's going on; and to make the sacrifices necessary for excellence." Thom's career excellence was recognized in 2000 with his induction into the DCI Hall of Fame. He was fortunate enough to experience a tremendous amount of success at an early age and because of that he can continue to work showing no signs of slowing down. According to Thom, "The spring semester tech class is an incredible opportunity for the students and teachers to learn new things. In looking back at the time we've spent over the past two years investigating different stroke techniques and their application, it's unbelievable how much my teaching has been stimulated and how these classes have impacted what I do in terms of my clinics now. The tech class is probably my most favorite aspect of my teaching at UMass." All levels There are also hundreds of people not on that list of alumni who have benefited in someway through the percussion and overall band program. There is teaching going on at all different levels by various alumni and it is partly because the Minuteman Marching Band does not turn people away. This philosophy developed by George Parks, the director of the band, is helped by the musical arrangements of Michael Klesch (Carolina Crown brass arranger) who both find a way for students of all ability levels to have a place within the Minuteman Band. UMass has had several great individual performers pass through the percussion section. In 1992, both Nick Angelis and Colin McNutt each became the DCI Individual and Ensemble champions (I&E) for snare and tenors, respectively, while marching with the Santa Clara Vanguard. In 2000, Nick met up with Jack Mansager, Darren Hazlet, and Damon Grant as performers with the original Tony Award-winning "Blast!" production on Broadway. Anthony Prochillo, of the Spartans, will make his way into UMass next fall as an incoming freshman. He is the current DCI I&E Champion for multipercussion. Yes, we're trying to attract more experienced players and as of late there are more students with drum corps experience coming to the university from places such as California, Colorado and New Mexico. Yes, the last three section leaders of the Cadets' drum line have all studied under Thom. Yes, there seems to be a constant flow of talent as if the percussionists on the alumni list have all been genetically engineered to perfection from some test tube over in the north campus labs. The truth is that "UMass is not blessed with great talent -- we build from within," Thom emphasized. "This has been our formula for success and continued improvement." Behind the tech class For the percussion section, the spring semester is the equivalent to the winter camps of drum corps, and the vehicle for improvement is the marching percussion tech class. The class started when Thom was a grad student and wanted to make the semester more productive for the marching band students. From its earliest stage as a one-hour meeting on Thursday nights, now the credited course is offered in an afternoon slot twice a week. Students from high schools and transfer undergrads who consider choosing UMass Amherst are welcome to come in and get a head start on the marching band season by playing right next to the current members. Thom feels that the tech class is vital to the program, and that "If you commit to what we're doing, you are given the opportunity to progress. There has to be energy which is driven from the membership that creates and enhances the whole momentum of the program." There is a successful system in place with certain methods, styles, thought and much research in technique.I am currently enrolled in the tech class and experience the progressive approach of the percussion program first hand. It's obvious that being involved in this class allows me to learn in a way that will prepare me to teach. I'm already thinking more as a teacher because the instruction occurs in such an organized way! Just as the others on the alumni list have done before me, soon the experiences will expand my mind. Then, my thoughts and variations can be built upon the fundamentals I've learned here to produce my own teaching style. It's this kind of emphasis on teaching that separates UMass from the others. Part of a team Aside from Thom's instruction, the program has had several graduate teaching assistants whom have become prominent figures throughout DCI. "You're never successful because of yourself. At UMass it's a team. Most successful people surround themselves with talented, competent individuals who directly impact and elevate the quality of what's offered" said Thom. Chris Retschulte, Colin McNutt, Brian Tinkle, Jeff Hope and Ian Hale are among the most successful teaching assistants from the list. Colin has remained involved as an adjunct teacher for the marching band. Ian's story is a bit different. He first met Thom at the 1994 Bands of America Summer Music Symposium, where he said, "That was pretty much the reason I marched Crossmen in 1998." Thom's instruction is what prompted the 25-year-old from Calgary, Canada, to pursue a master's degree at UMass Amherst many years later. Support and facilities Strong support from the University itself is just one reason the UMass marching percussion program is so successful. The on-campus facility available to the band that houses the percussion equipment is a rare commodity, and virtually unheard of at other colleges. There are students putting in hours and hours of hard work everyday at the acoustically designed practice space known as Grinnell Arena. I often walk towards the building finding myself welcomed by the rata-tat-tat sounds from within the walls. After all, in the Northeast there won't be too much rehearsing going on outdoors until late April. Another huge part of the program is the percussion manufacturers who have generously donated thousands of dollars in equipment. Thom's longstanding affiliation as a product consultant and clinician with the Pearl Corporation/Adams, Avedis Zildjian Cymbals, Vic Firth Sticks and Mallets and Evans Drumheads has extended to their support of the marching percussion program at UMass Amherst. And what a difference it has made! UMass is one of the few band programs in the country where a comprehensive sponsorship situation exists at such a high level. Zildjian and Vic Firth also offer a $1,000 scholarship to the Minuteman Band each year which is awarded by Thom to students who have exhibited long term commitment, exemplary dedication, and leadership amongst fellow members. The Vic Firth team has spent many hours taping the percussion program and showcasing it on the company website. As a result Thom feels the exposure of UMass through online media has achieved not only national, but international recognition. One thing is very clear: These percussion manufacturers are helping out because they recognize there is a quality program and good people here at UMass Amherst. You will find a unique story for everyone that's been involved in the Minuteman Band percussion program, be it graduate or undergraduate, East Coast or West Coast, drum corps veteran or aspiring fan. If you're interested in teaching, writing, or the business of marching percussion, UMass Amherst just might be the place for you. Perhaps you'll be the next name on the list. For more information on the University of Massachusetts Marching Percussion program please visit our Web site at www.umassdrumline.org. Lance Piantaggini, 23, is a senior at the University of Massachusetts Amherst where he is pursuing a degree in classics. He marched with the Spartans from '01 to '04 and is currently their cymbal technician. Lance is excited to bring his orchestral percussion experience to the field with techniques inspired by instruction from Eduardo Leandro and Thom Hannum. He also enjoys writing music/drill for several high schools in Massachusetts, and performing and arranging for the MASS Marimba Band at UMass.